Fiberglass boat restoration tricks even beginners can use! Now Even Beginners Can Have Success! 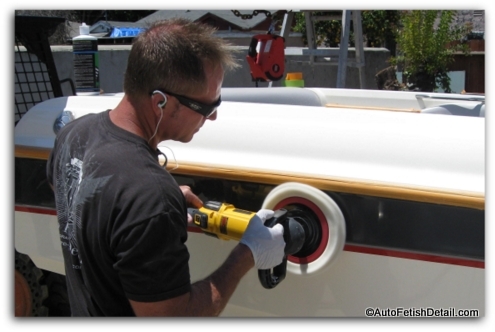 Back before the current boat polishers were introduced, fiberglass boat restoration was a task left only to professionals with years of experience. Now with improvements to both tools and products, it is possible for beginners to achieve results that were commonly reserved for veteran boat and car detailers. 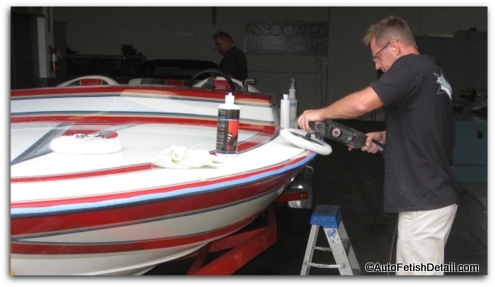 From boat polishers with lower operating speeds, compounds and polishes that are formulated to be much more user friendly, now a boat owner like yourself with beginner DIY skills has a fighting chance to perform professional level results when it comes to restoring oxidized fiberglass or gel coat. Helping you to have a fighting chance! Like every other area of life, the industry (in this case: auto detailing or boat detailing industry) would bury you with information that is ultimately trying to separate you from as much of your money a possible. I have come to realize that most boat owners recognize when their boat has begun to oxidize or is already oxidized. At this point many boat owners like yourself go in search of the best ways to perform fiberglass boat restoration. "With advances in equipment and products, you as a boat owner can have a fighting chance when it comes to removing the oxidation from your boat. I am here to show you what actually works." When it comes to removing oxidation from a boat with lasting results, a rotary (high-speed) polisher is one of the necessary requirements. While there are entry level steps to restore your fiberglass boat by using a boat cleaner wax and trying to rub out the oxidation by hand, if you are looking for professional grade results that last, a high-speed polisher is really your only chance. One thing I have learned along the way in my professional career is that virtually every boat owner severely underestimates what is required to actually remove the oxidation from a boat. 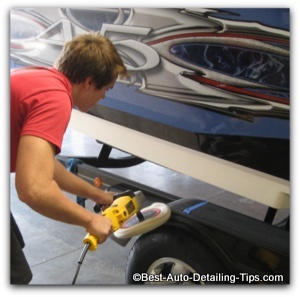 Most boat owners think that a lot of rubbing with some top rated boat cleaner wax is going to be the fix. While this will have the ability to make a visual difference, in most cases the results will not last and are simply insufficient for what is actually required to make a lasting difference. Which side wold you rather have your boat look like? This is a before and after shot after the gel coat was restored to original shine and luster using a high-speed buffer. I taped off the section at the right so it would go untouched during the restoration process that I did on the section on left. The rub-rail is still covered with blue painters tape I recommend for protection during the process. You would never get these kinds of results simply rubbing your boat out by hand! Your bare minimum plan for success! The Mercedes of rotary polisher; German engineering at its best. If you demand only the best, then this is it! Suitable for any of your polishing needs for auto, boat, RV. My first choice in rotary polishers whether I am polishing on a car, boat, or RV. Quieter and lighter than the DeWalt below. As a professional with decades of experience detailing boats and restoring the fiberglass or gel coat on boats it would be hard for me to decide which part of the equation is the most critical between using the right type of polisher versus my choice in rubbing compounds. Darren's Note: When I say the "right type of polisher", I am referring to a rotary versus a dual-action/random orbital buffer. There are many people that will tell you you can use a dual action buffer on a boat; which you can. The problem is that fiberglass/gel coat is such a tough and durable material that oxidizes easily, that using a dual action/random orbital buffer will definitely be easier to use, but they simply cannot produce the required friction, pressure, and speed required to have lasting and professional results when it comes to polishing oxidized gel coat/fiberglass. I know that the right compound can make or break you just like using the right type of buffer. The only compounds and polishes I recommend and use when I am working professional to perform fiberglass boat restoration is the products from CSI. Along with the required boat polishers and my recommended compound and polish, you will definitely need the following tools and equipment. If you are serious about fiberglass boat restoration you are going to need more than a single wool pad that each of these kits come with. These are the type of wool cutting pads I prefer and exactly the kind of cutting pad you will need first when doing fiberglass boat restoration. I have tried other "wool" pads that are blends, but find they do not perform as well as these 100% wool pads. If you are cheap, you can force your way through your entire boat with a single wool pad to remove the initial oxidation, but don't underestimate how nice a brand new pad will outperform an overly used wool pad. Only you will decide when you need to change the pads out. Much of this depends on whether you use the pad washer or the spur to keep your pad clean in between compound applications. I actually use both the pad washer and the spur. After compounding a 2' x 2' section of your boat, I take the polishing pad to the pad washer, then I use the spur to remove any extra water and to further separate and loosen the wool fibers. I use this after every 2' x 2' section of polishing I do. Simply hold the polisher against your leg and press the spur into the pad as the buffer is spinning. Releases the build-up of polish and gel coat oxidation. Keeps wool pad fibers separated during use. I am a huge fan of this wondrous tool. Was skeptical at first, but then I tried it! Keeps the pad damp with water which helps in the actual polishing. Can also be used dry if somehow you prefer to keep a dry polishing pad. As a rule, I prefer to use a damp polish pad regardless of the pad material, eg. wool, foam, micro-fiber. Expensive tool, but if you are serious about results and understand exactly how the right (or wrong) tool can make or break your world. Very useful when using wool cutting pads to remove excess wool fibers and used compound/polishes; especially useful on any brand new pad to remove the excess wool fibers before first use. 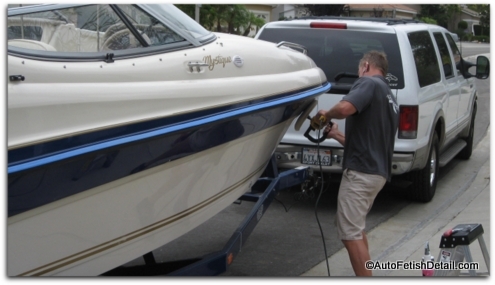 The picture at the right showing my 16 year old son using a high-speed buffer for the first time as he polishes the fender of the boat trailer. These buffers are so much more user friendly than previous generation polishers. 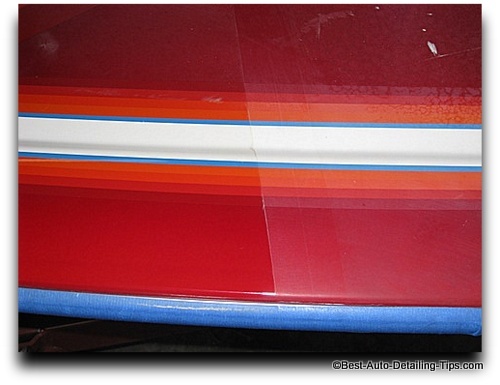 It is common for people to make a comparison between car paint and working on gelcoat/fiberglass; fiberglass boat restoration will be far more aggressive and time consuming. Gelcoat/fiberglass is a very tough and durable material that is able to handle far more friction, heat, and aggressiveness than car paints. If you have ever polished on your car before, restoring gel coat or fiberglass will require far more product, pressure, and speeds for true professional results when it comes to heavy layers of oxidation. Use common blue painters tape to mask off any areas to protect from the buffer pad and sling from polish. For heavy levels of oxidation, it will not be uncommon for me to go over the same section 2-3 times before desired results are achieved. I use an RPM range between 1200-1500 RPM's when polishing on boats. Many guys will go as high as 1800-2100 RPM's. If the oxidation is heavy; expect to go back over each section with multiple applications of compound. I apply the compound to the center of the pad rather than directly onto the boat. I use about a quarter (American quarter) size of compound for each section. This is usually enough to polish a 2 x 2 foot section of your fiberglass boat restoration area.